The Memorandum of Understanding ceremony between Massey University and Wageningen University and Research. From left: Vice-Chancellor Steve Maharey, Queen Màxima, King Willem-Alexander, Dr Bram de Vos from Wageningen University and Research and Netherlands Minister for Economic Affairs Henk Kamp. Photo credit: Mark Tantrum Photography Ltd. 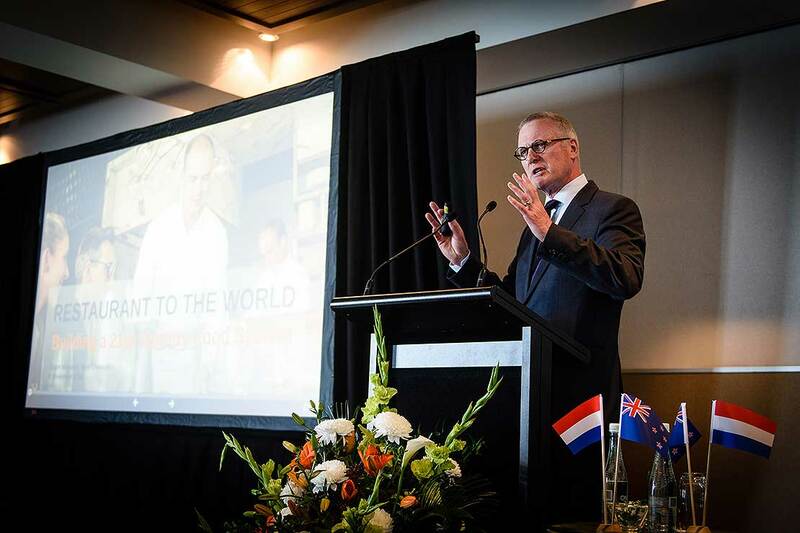 The Future of Food Forum, hosted by the Embassy of the Netherlands in cooperation with Massey University and FoodHQ, attracted more than 100 representatives from the Dutch and New Zealand food and trade sectors. 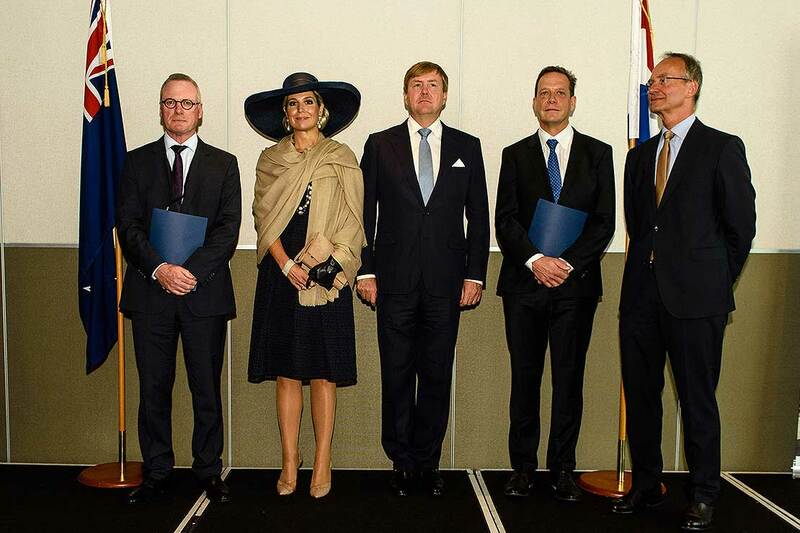 Led by King Willem-Alexander and Queen Màxima, the Dutch delegation joined New Zealand industry and government representatives at Auckland’s Hilton Hotel yesterday. The forum was to discuss the many links and parallels between the Netherlands and New Zealand around sustainable food commerce, agriculture and horticulture. It was opened by Science and Innovation Minister Steven Joyce and Netherlands Minister for Economic Affairs Henk Kamp. Mr Joyce said the future of food in New Zealand is all about diversification and adding value – "designing products which are nutritious and appeal to a wide range of consumer markets. "Our backyard is the Asia market, and we are investing a lot in determining and responding to consumer preferences," he said. "The Government is working alongside industry, and we have a number of innovation programmes, one of course being the Primary Growth Partnership, and we have established the Food Innovation Network. We are encouraging universities to develop more in this area, and I want to acknowledge Massey University and [Vice-Chancellor] Steve Maharey for the establishment of FoodHQ in Palmerston North." The University also renewed a memorandum of understanding with Wageningen University and Research, which Mr Joyce described as "a particularly important milestone”. Vice-Chancellor Steve Maharey addressing the Future of Food Forum. Photo credit: Mark Tantrum Photography Ltd.
Mr Maharey gave a presentation on his concept of taking New Zealand’s “restaurant" to the world as the population grows to more than nine billion. "We have to feed them somehow," he said. “This country can play its part; the Netherlands can play its part. About 40 million people around the world will get some food from us at the present time, and of course we produce a lot of ingredients, so that may rise to 100 million people, but that’s still not 10 billion." Mr Maharey also joined Queen Màxima as she walked through trade booths, including one from Massey University, while King Willem-Alexander visited booths including FoodHQ, which was hosted by programme director Mark Ward. The forum also included presentations and discussions between leaders from the private and public sector, including Fonterra chief executive and Dutch-native Theo Spierings, Zespri chief executive Lain Jager and winemaker Brent Marris from Marisco Wines. The royal couple visited seven trade booths at the Forum. 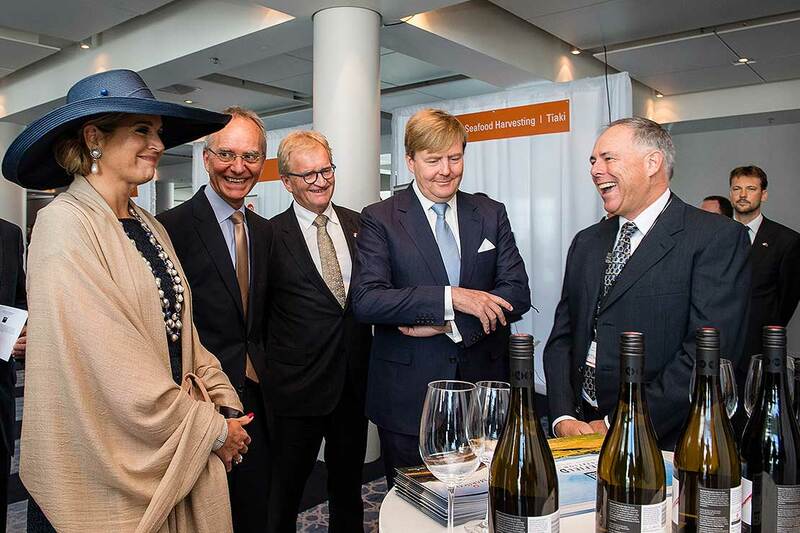 From Left: Queen Màxima, Netherlands Minister for Economic Affairs Henk Kamp, President of the Confederation of Netherlands Business and Employers Hans de Boer, King Willem-Alexander and winemaker Brent Marris from Marisco Wines. Photo credit: Mark Tantrum Photography Ltd.
A trade lunch was held at the Hilton, with members of the Dutch economics delegation and representatives from the New Zealand business community. In his speech, King Willem-Alexander stated that New Zealand and the Netherlands shared the same open mentality dedicated to trade, exports and business. He also expressed his delight for the agreements signed during the visit. The rest of the forum’s guests were treated to lunch at Sanford Seafood Ltd followed by several presentations including hearing about current research and innovation in the sector from Massey University director of agrifood business Professor Claire Massey and Sanford general manager of innovation Andrew Stanley. The afternoon session wrapped up with a tour of the factory and its seafood cooking school.